Manage your finances wherever you go, with the Zoho Books mobile app. Add Zoho Books widget to your Android app's home screen and quickly create invoices, expenses and log time. 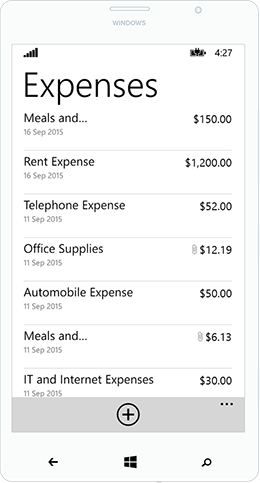 Snap pictures of your expense receipts with your phone and attach them to the expenses you've recorded. Why log out and log in every time? Create a pass code lock for your app for an easy, fast login. See how well your business is doing by running reports on how much you've made and expenses you've incurred, all with a single tap. Pair your watch with your android device and receive notification whenever your customers view invoices, accept or decline estimates, and make payments. 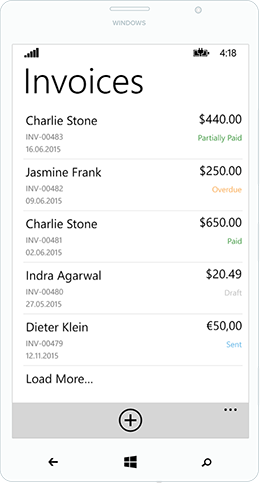 Create and send invoices to your customers with a single touch, and record payments as soon as your customers pay you. Effortlessly track your reimbursable expenses. Snap and attach images of expense receipts and immediately bill them to your clients. All it takes is a single glance at the dashboard to see how your business is doing. Track time and tasks for your projects easily by logging the time you spent on a task, for accurate recording of billable hours. Send out invoices, estimates and account statements to customers with our iMessage app. With the help of GPS and Apple Maps, track the distance you travel and turn it into an expense. Set reminders for your transactions using Siri's contextual reminders. Using 3D Touch, you can now get a quick sense of the specifics of a transaction. You can also create a new transaction right from the home screen. View outstanding invoices and send payment reminders right from your Apple Watch. You can also track time while you work on projects. "It made my accounting simple." "Awesome app This app is very simple to use. Even though I have no background in accounting, I am able to use it."" "Been a great solution to documenting consulting hours and billing for my time." "I have been using Zoho Books app for sometime now and found it very useful. It is easy to use, intuitive and nicely designed. This is a nice companion to the web version and allows easy mobile access." "Best accounting app out there Great UI with massive results as far as record keeping is concerned. I would recommend it to all." "Excellent product that can be managed across multiple devices." "Very useful app for businesses." "The best Accounting App for now Complete feature for new business of small company or mid range and suitable for managing small amount of staff or mid amount .. some feature still need improve for better performance." Do I have to pay separately for the mobile app? Zoho Books mobile app is a supplement to the web based Zoho Books application. If you already have an account with Zoho Books, you can download the app for free, sign in to your Zoho Books account and carry on with your accounting. You can also check out the pricing here. Can I track time using the mobile app? 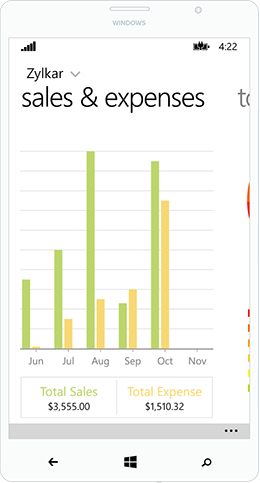 Yes, you can track time spent on a project and bill your clients from within the app. 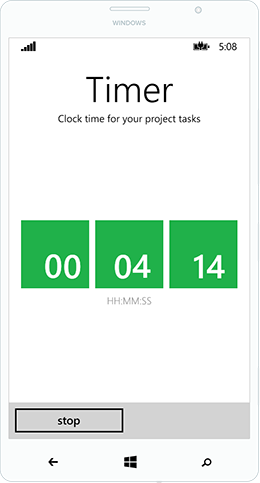 Yes, you can track time spent on a project using the mobile app. Does the mobile app offer template customization? No, you cannot edit the templates from the mobile app. However, you have the option to choose the template of your choice from the gallery of templates we offer and later edit it using the web app. Can I record multi-currency transaction using the mobile app? Yes, Zoho Books mobile apps support transaction in multiple currencies. Can we create recurring transactions from the mobile app? Yes, with Zoho Books mobile app, you can create recurring transactions.